The second Miracle is I am finally updating my blog. The first Miracle made the second necessary. 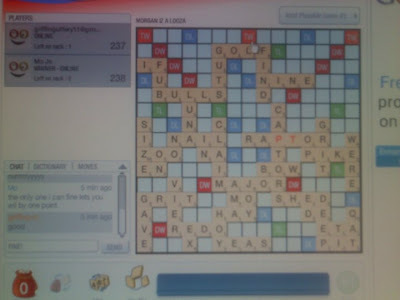 I beat Griffin at scrabble yesterday! Only by one point, but it doesn’t matter… I won. Now, I tried to do a fancy screen shot like Erica did when she posted about beating Michelle at scrabble, but clearly she is much smarter than me because I couldn’t figure out how to do it. Instead my crappy cell phone pictures must suffice as proof. In case you can’t read it, it says Griffin: 237 Morgan: 238. Behold the majesty of this blurry cell phone picture. Four years ago today I had a dance concert. After the performance and boy named Griffin took me to the movies on a first date. We saw King Kong, a movie I have never seen again, mainly because of my extreme hatred for these disgustingly overgrown bugs. Anyway, we have been together ever since so… Happy Anniversary Baby! I love you so much and I miss you like crazy, hurry up and come home already! I leave tomorrow and return Sunday from a trip to Texas to see and big sister. Now you ask, what could take me away at a time that would prevent me from seeing New Moon opening day? And I reply, Nothing, except that the whole reason for me going is she doesn’t want to see it with out me, so she is flying me down there just for that purpose. She asked if she paid for it would I go see it with her and I said “uh, yeah, duh!” It might be terrible but I don’t care… I will content myself with watching a movie with beefed up, underage, Taylor Lautner with no shirt on half of the time, and be content. Taylor, Kirsten, and Robert…. I will see you at midnight. I just got home from work and read about the fort hood shooting and freaked out. My sister lives on that army base until next weekend. Then I called and she didn't answer. But she finally called me back and she is ok. She and everyone else on base are on lock down. If i find out anything that only someone on base would hear i will inform. Now all we can to is pray for the family on the dead and for the injured. I and finished, through, done, with English 101! Hurray for me! i don't know my grade yet, but i don't really care, I'm 90% sure it's good. I love you new cell phone, welcome to my life! I'm Morgan. I love dance, music, singing, art, poetry, writing, and spell check. But most of all, I love my Lord, my family, friends and my boy friend of three years, Griffin.